Week Three of The One Challenge is in the books. Check it off the list ✔️. In theory, week three marks the halfway point of the project…in reality, we still have a way to go. And I am sure we are not the only ones in the ORC universe feeling the time crunch 😉. Of course, some progress has been made. We started with a sunroom that had lost its purpose, we installed (ahem, hired someone to install) some black slate floors, and this week the walls got some extra love and attention. The wood window trim is also getting a fresh coat of white paint. The downstairs woodwork has mostly all been converted to white, so the sunroom wanted to join the party. I originally thought I would tackle this job…and then decided to let the experts have all the fun. We were already getting our exterior painted, and when there was rain in the forecast, they fit us into the schedule. In the end, I’m so thankful they worked us in. One coat of contact primer, one coat of stain blocker, three coats of paint, and the job is going to be done tomorrow. Eek! I would have never finished! This weekend will be daybed and bookcase building weekend. All hands will be on deck as we try to knock out the focal point of the room 💪. So, make sure to check in next week and see the (hopefully incredible) progress. In the meantime, there are so many amazing rooms coming together over at the ORC blog. And…our first One Room Challenge endeavor is complete!! We did it! 👏 Normally, I lean toward checking something off the list and moving on, but I do want to take a moment to celebrate. 🎉🎉This project required a looong weekend of work to wrap everything up, but final reveal day is here, and I could not be more excited to share the space with you! If you are new here, KS Design Company is a mother-daughter team working in Topeka and the Kansas City area. You can read more about us here. This is our first time participating in the One Room Challenge. We have been designing a budget-friendly look for my living room, turning it into a functional, casual, and eclectic space in just six weeks. Make sure to catch up on previous weeks (because isn’t the journey is the best part?). To get us started, here is a before photo. There wasn’t necessarily anything wrong with the living room before, but it is our family’s main living space and had stayed the same for eight years. I wanted it to better reflect my taste and to be more functional. Ta-da! The new space! The room feels bright and calm, fairly neutral but not boring. The top goal going into the project was increasing functionality. One aspect of that was providing more seating for when we have family and friends over. The sofa was purchased from a local store, and beyond my love of its rich navy color, this thing is long and can easily seat four people. The room is on the smaller side, so the furniture configurations are limited. I knew something would have to go in front of the picture window. We previously had chairs, but I thought our family our dog would enjoy a secondary sofa more. I chose a chaise lounge because it blocks the window less than a traditional loveseat or apartment sofa. The chaise lounge was a steal of a deal, but it is very sturdy and the fabric is a very soft black velvet. Finally, the rattan chair provides one more seat but isn’t visually heavy in the room (and the casters allow us to easily roll it into the dining room if extra seating is needed there). The other main component of functionality was increasing toy storage. To this end, my dad built shelving to flank both sides of the fireplace. The shelving can hold up to twelve wicker baskets, which is our method of choice for housing toys, but so far six baskets hold the toys easily. (Grandparents: this does not mean we need more toys). My toddler has already taken a liking to the shelves and can easily pull out his baskets of toys when the desire strikes. Hello there, sleek looking fireplace. The fireplace hearth was painted using a high heat paint, and the outside brick was painted a glossy black. The hearth was retiled with a soapstone-esque tile. My husband did the backbreaking work of removing the old tile and laying the new, but I did learn a new skill (thanks YouTube!) and grouted it. We chose a dark charcoal grout because we wanted the material of the tile to catch the eye, rather than its hexagonal shape. The overall look is much more cohesive, and the black adds a bit of drama to the focal point of the room. Doesn’t the DIY art deco mirror look like perfection above the fireplace? It makes a statement even with simple accessories. Actually, after my mom and I spent a lot of time playing around with the mantle, we decided it looked best with simple accessories. I guess the mirror knows its the star. We chose to install pull down shades instead of curtains for the windows flanking the fireplace. Pros of this choice: very affordable, Lowes cuts them to size, they keep that angle of the room looking clean-lined. Cons of this choice: boring. To spice them up, we added DIY leather tabs. My mom cut a strip of faux-leather, used an awl to punch a hole in the shade, and then inserted the brass post fasteners (sold in the leather supply section of a craft store). Originally, I had my heart set on a leather sofa, but that wasn’t working with budget, so we tried to find places to add touches of leather instead. I think it’s those little details that make the room special. I thought I wanted a kids’ table somewhere in the space, but real estate is so precious in our living room, so I wasn’t 100 percent sure. After texting all my friends—Is a kids’ table worth it? ?—and getting a resounding yes, I knew it was time to get creative. My dad built a flip-down kids desk for the space between the picture window and the door. 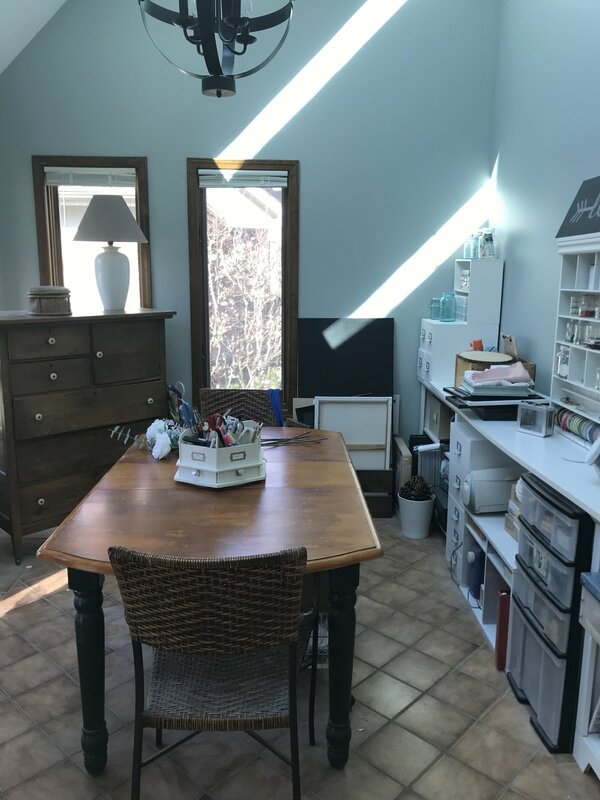 At 20x30 in, it has a large work space when it is flipped down, but once my toddler is finished playing or crafting, then away it goes. Plus, it hides all the art supplies. The top of the desk acts a command center of sorts and has a couple necessities in our life—a clock that can be seen from anywhere in the room and a clipboard where we can hang invitations, reminders, photos, or whatever is making us happy that week. Let’s talk curtains and curtain rods. I got it into my head that I wanted pinch-pleat curtains but didn’t have the time to add that to the DIY project list. IKEA to the rescue. Although the curtain had to be hemmed because IKEA sells 98” as their shortest length, I am really happy with weight of the curtain and the pleating. And the price, of course! I wanted to keep the curtain rod to save some money, but it was not my style. Then I realized that actually the finial wasn’t my style. My mom came up with an easy and striking DIY for a new finial. First, she cut down long styrofoam rods to the finial length we wanted. Then, she wrapped them with faux-leather using straight pins to hold the leather in place on the backside. Finally, she painted both open ends with craft paint, and using the screw from the old finial stuck it into the styrofoam so the entire finial could then be screwed back into the rod. After our wallpaper woes, I am happy to report that the framed wallpaper entry turned out beautifully. We loosely followed this tutorial to hang the molding, which we painted navy prior to hanging. Why is black and navy taboo? It is perfection in my book. Painting the door green was a last minute decision, not a part of the original plan. We had leftover green paint from painting the back of the shelving and decided to just go for it! So, off its hinges the door went. We rolled the door on sawhorses set up in the middle of the living room late Sunday night. What a good decision. It complements the wallpaper so well and adds a extra oomph to that area of the room. And that green…I just can’t get enough. When you walk through the front door, the altered portrait (aka Dapper Dan, aka Decapitated Dan) greets you. My husband thinks it’s an odd choice, but I can get behind quirky elements, and this art print fits the bill. The other area of the room that needed artwork was behind the sofa. I wanted one large print that was still affordable. Jenny Komenda posted about printing art on vinyl in her Instagram stories, and it ended up being an excellent solution. I purchased a print, took it to my local printer where they printed it on flat vinyl. They printed it to fit the IKEA canvas frame, which comes in white, black, or gold. The print cost $20, the printing cost $107, and the frame cost $29. 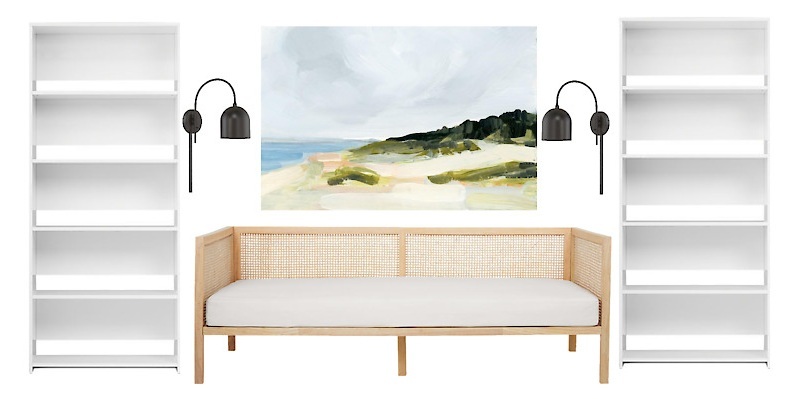 That totals $156 for a large piece of art—not too shabby. The sconce that I lucked into flanks one side of the art. It is large and makes a statement in the room, but it is also very functional and gives off a lot of light. A modern floor lamp flanks the other side, and the great thing about that lamp is it has three levels of brightness. My friend Natalie whipped up the two oversized throw pillows. To add a touch of leather to this side of the room, she sewed a leather stripe through one. Both pillows turned out fantastic! The smaller throw pillows I had to hunt around for. The copper-toned velvet adds some warmth. The hints of blue and gold in the distressed pattern tie into the sofa and the frame behind the sofa (and the pillow has leather trim!). Also, a big thank you to One Room Challenge, especially the creator Linda Weinstein, and Better Homes and Gardens for organizing everything. Make sure you look at the final reveals of the 20 featured designers and the other guest participants. So. much. inspiration. We would love to hear from you in the comments! Your comments really and truly make our day. What is your favorite part of the room? Also, keep up with us on Instagram—holiday decorating is right around the corner! The end is near! Only one week left of the One Room Challenge and lots of finishing touches to go. I counted them up today, and there are seven projects that have been started but are not quite finished. And that does not include the hanging of everything and the styling that will take place at the end. 😱 As a break from our bigger projects, we played around styling the mantle. We’ll have to see if it makes the final cut. The plan is to go into worker bee mode this weekend, turn on a good podcast, and get it all done. Installing the ceiling fan. What a difference a new fan makes! I could not stop staring at this beauty after it was installed over the weekend. 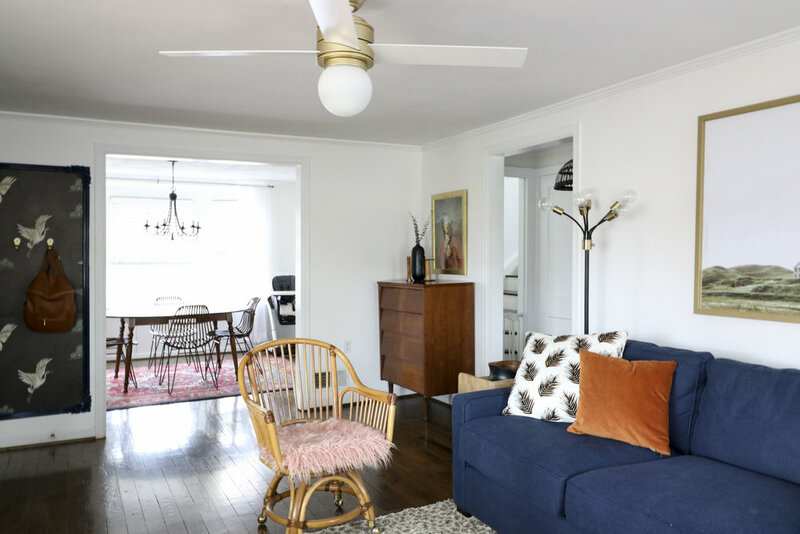 Let’s face it, ceiling fans are often kind of ugly. My top goal for the living room, though, was to make sure it was functional, and we use our ceiling fan a lot. So a ceiling fan had to stay. Luckily, my mom found a new one that fit the bill: stylish, affordable, and from a brand that we have used and liked in the past. The blade shape and globe light look modern, the white and brass tie into the room without screaming look at me, and it even comes with a very functional wall switch. After it went up, I felt a turning point where the tone of the room was really starting to change. Exciting! Ignore the ceiling paint around the fan; touching it up is on the to-do list! Hanging the wallpaper. Confession time: I am kind of awful at hanging wallpaper. This was my first time hanging wallpaper, and it was tricky. The wallpaper was unpasted and the process was laborious. How do air bubbles magically reappear after an entire section has been smoothed?!? My thoughts at this moment: Hmmmm…this isn’t looking too great…. Did I almost cry when I got to the bottom of a seam and discovered a millimeter gap between the panels? Maybe. Was the work worth it in the end? Hopefully! The project is not all the way finished, and my wallpapering job is by no means perfect, but I will say that I am in love with the print on the wallpaper. Here is a sneak peek. My take aways from wallpapering are the following: 1. Take the reviewers seriously when they say it is a job for the professionals. 2. Embrace the wallpaper smoothing tool. You will be using it a lot. 3. Do the project with someone who has a positive attitude (My mom is the best!) 4. Keep your chin up because you get into a rhythm as you go along. In great news, almost all the purchases have been made. Since we have reached that point, I wanted to break down the budget. Of course, I am a sucker for good design, no matter the price point. But, when I scroll through all the eye candy on blogs and Instagram, I often catch myself thinking the following: This looks great. What was their budget? Is this realistic for my house, my budget? So, instead of leaving you all guessing, I wanted to be transparent about the budget. The goal was to spend under $3000, really aiming for closer to that $2500 mark. That is not a small amount of money by any means and is not a small amount to my husband and me, but when you are talking about a whole living room makeover, it doesn’t leave wiggle room in the spending. With every item we purchased, I was conscious of the budget, shopping during sales or using coupons. Here is the breakdown. Obviously we didn’t 100% hit that $2500 mark, but we definitely stayed under $3000. I will take it! I wanted to use this sconce in the living room, but when I went to order it a couple of weeks ago, the sconce had just gone to backorder status and wasn’t expected to ship until Nov. 8. It was such a bummer. I am persistent though (and maybe a tad stubborn). I called our local store just to make sure there wasn’t one in stock. And…there was one! The employee said that someone had returned one, and he would put it on hold for me. I truly felt lucky. The next day when I went to pick it up the same employee was working, and he said, “I didn’t tell you this yesterday, but with returns, we put them in the clearance section of our home goods, so this is significantly cheaper.” You guys, this $149 sconce was only $45. What!?! It made my whole week. Here is an updated to-do list. Italics= partially completed. Time to wrap things up, but I am so excited for the final reveal next week! There are so many elements of the room that have yet to be revealed! I have a feeling next week’s post will be a long one. 😉 Until then, make sure you stop by the One Room Challenge blog and admire the hard work of the 20 featured designers and all the guest participants. Hi, friends! It is Week 4 of the One Room Challenge, and things are moving along. Items are getting checked off the to-do list, we are having to move to Plan B at times, and there is still plenty left to accomplish. If you are new to our KS Design Company, read more about us here. My mom and I are updating my living room for the One Room Challenge— meaning we have six weeks to complete the space. Make sure to also check out the before photos of the living room, our vision, and the baby steps we took last week. First up for this week, my husband and I (finally) painted the room! It required painting during nap times and late into the night, but we did it! 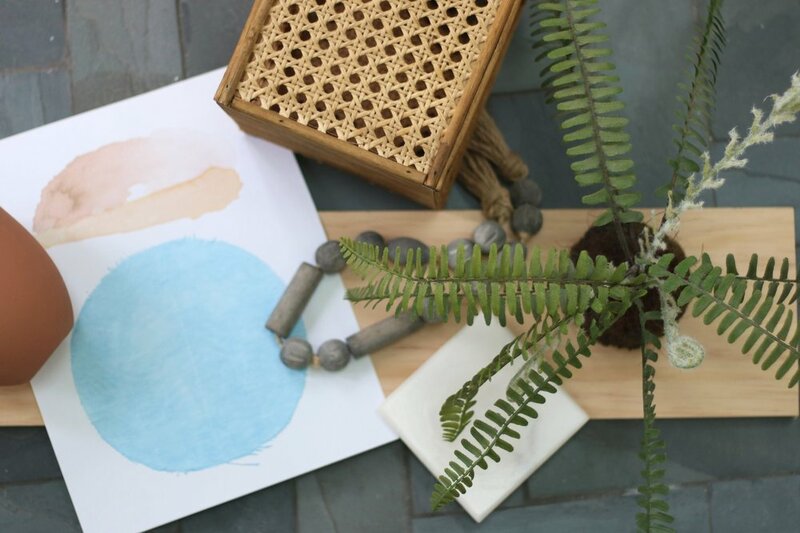 Over the last several years, I have slowly painted almost every room in our house white, and although the living room held strong to its gray roots for eight years, it too succumbed to the white paint. I realize that white rooms are very popular right now, so I am not doing anything earth-shattering by painting the living room that color, but there is something so refreshing, so simple, so calming about white walls. Once the room was painted, I knew it was the right choice. And although my husband has only allowed white walls to take over our house out of a love for me, he even admitted that the room seemed bigger and brighter. 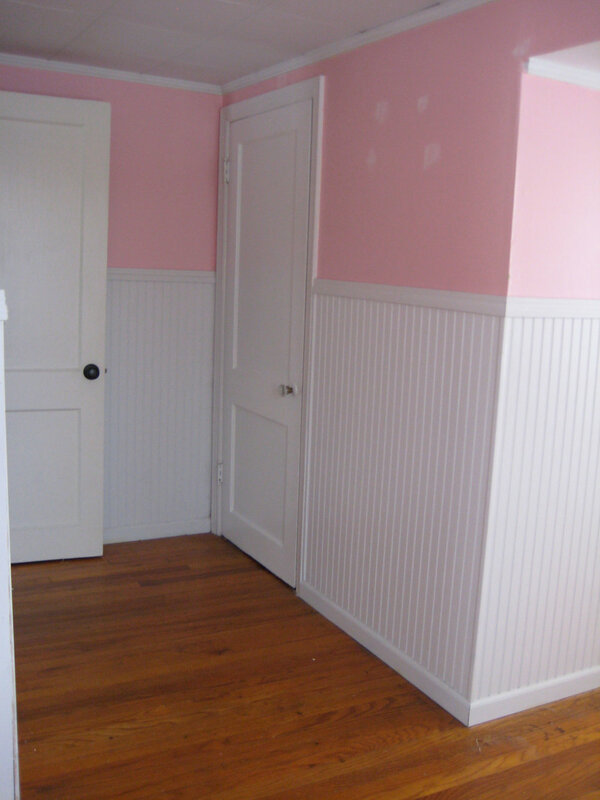 We used the paint color Bistro White from Valspar, simply because it is the white color we have successfully used in other spaces in our home. Bistro White is a creamy white, definitely not stark, but it also doesn’t read yellow. It works well with both the abundant natural light our home gets in the winter and the limited natural light our home gets in the summer. The next change to the room was the shelving my dad graciously built—thanks, Dad!—for either side of the fireplace. The main purpose of shelving is toy storage. Our old TV stand held four of these storage baskets, and my dad built the shelves so that they could hold 12!! We won’t need that many, but we are definitely adding a couple more. We still have to add some trim and paint the shelves, but here is one side of the shelving in the spot it will go. A mirror. When I was planning for the room, I visualized having a mirror above the fireplace. I didn’t want the mirror to be overly traditional, and if I had all the $$$, then I would have gone with this beauty. Knowing that wasn’t in the budget, I continued the search and fell in love with art deco fan mirrors. They feel modern, they aren’t overused in design, and they’re a touch glamorous. Sold. Except…I could not find one in my price range. Case in point. The prices of the art deco mirrors were even more expensive than the original mirror I wanted. Yikes. Mirrors are so hard to photograph! My mom thought it was worth trying to semi-DIY it. And, I am so glad she came up with that idea. First, she created templates from poster board for each section of the fan mirror. 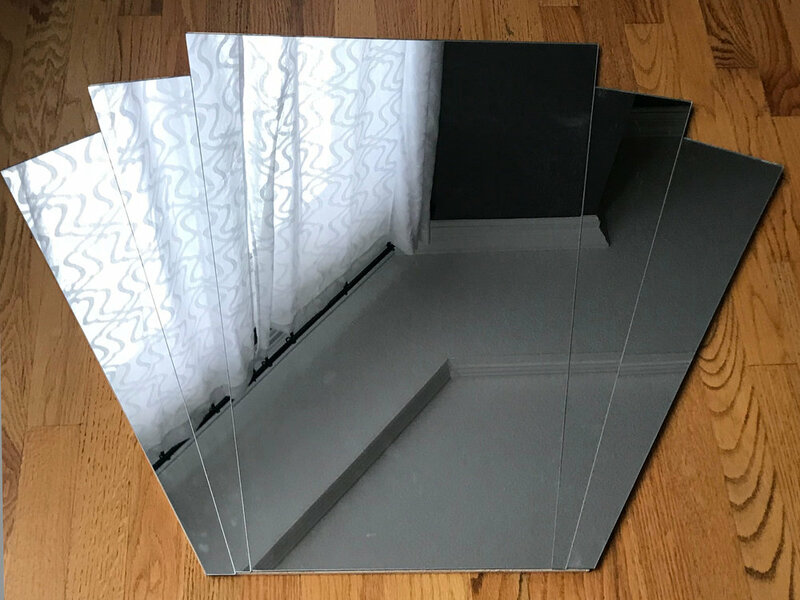 She toyed with the idea of trying to cut the mirror herself using an online tutorial, but a local glass cutting company said they would supply the mirror, cut the mirror according to the templates, and sand the edges for $85. It was a no brainer to go that route. We did choose the thinnest mirror to keep the cost down, so my mom adhered the mirror to quarter-inch plywood, which my dad cut using a jigsaw. The plywood gives the mirror the stability it needs to lean on my mantle. Cushions. Next up, was a sewing project that my friend Natalie, the sewing guru in my life, helped me execute (aka she did all the sewing while I provided conversation). 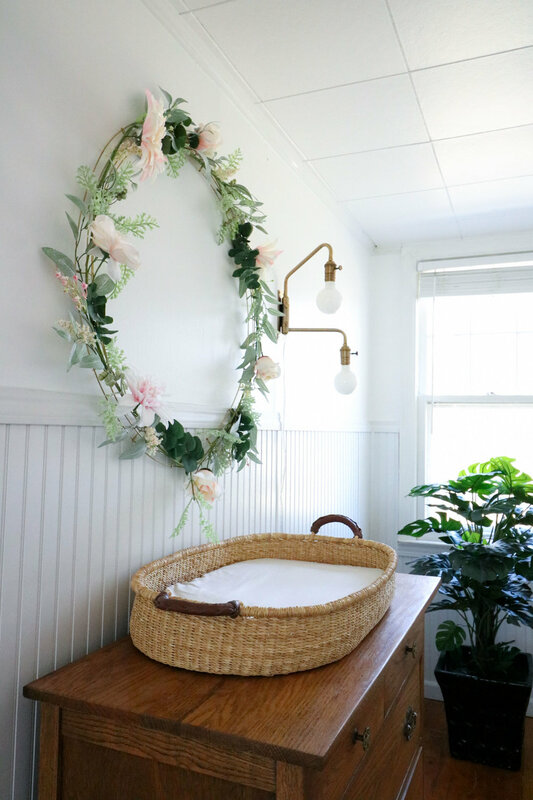 Last week, I shared about my recent Craigslist score, some dreamy rattan chairs that lacked cushions, and I previewed the fabric that I was going to use for cushions, some fun pink fur. It was fun to see the plans come together! At first, I wanted to find outdoor cushions that would fit the chairs and could just be recovered, but I had zero luck on that front. So, moving on to Plan B, I cut foam to fit the seat of the chair, and then Natalie sewed a cushion to cover the foam. Quick tip: Foam can quickly get pricey. The best prices on foam I could find were at Walmart. One pro of working with fur was that it was so forgiving. Nothing had to be perfect; it still looked good. And as we have been working on the DIY projects, our purchases have begun arriving! Here is a peek at the couch; needless to say, our dog approves. And to end things, here is an updated to-do list. Italics= partially completed. Make sure you check in with 20 featured designers participating in the One Room Challenge and the other guest participants. There are so many inspiring designs coming to life! Welcome to Week 3 of the One Room Challenge! If you are new to our site, we are so glad you are here. My mom and I, aka KS Design Company, are making over my living room in six weeks. Make sure to check out the before photos of the space and the overall vision. This week is the official halfway point of the challenge…and we have way more than half of the work left to do. What can I say? We are saving the best for last. 😉 But, there is progress to celebrate. Here is a taste of what we have been working on. The print is this dapper fellow from the Etsy shop ChaosandWonderDesign. You guys, this is a gem of a shop, full of printable goodies for your walls: altered portraits, moody florals, figure art. Someone please use this or this in their space. Most of the printables are $6, and the shop owner graciously resized the portrait to a custom size for me. The tile will be for the hearth of the fireplace. Tile hunting took place at Floor and Decor this past week. Have you been?? Floor and Decor is fairly new to the Kansas City metro, and it’s safe to say that my mom and I are big fans. Since we plan to paint the brick on the face of the fireplace black, I wanted a black tile for the hearth to give a seamless look. I am a sucker for soapstone or a soapstone look, and although I originally didn’t plan on choosing a hexagon tile, this one fit the bill. That delicate white veining? So pretty. The fireplace mantle and and wood surround will stay painted white. So, in the end, we are hoping the fireplace looks similar to this inspiration from the brilliant Emily Henderson. I originally wanted to get one of these rattan chairs to use as an accent chair in the living room. Then, I stumbled upon a set of four rattan chairs on Craigslist for half the price. Here they are in the listing. I have to say that I was feeling pretty proud of myself…until I drove off from purchasing the chairs with my wallet sitting on the top of the car. Womp womp. Still, the chairs are pretty great. Their only downfall is they are sans cushion. Enter pink fur. The plan is to create a cushion with foam and then sew a cover using the pink fur. Here is the updated to-do list. Italics= partially completed. This weekend will be one of painting and buying and perhaps building. As always, make sure you check out the 20 featured designers and the other guest participants. We are tackling the One Room Challenge!! 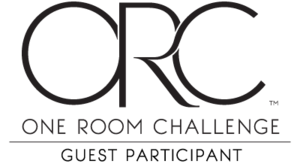 The One Room Challenge is a bi-annual event that features 20 featured designers and many guest participants who makeover a room in six weeks. The event is hosted by Linda Weinstein of Calling It Home and Better Homes and Gardens. By the way, if you’re here from ORC, welcome to KS Design Company! We are a mother-daughter team based in Kansas. KS Design Company is a brand-new venture for us. We are excited, motivated, nervous, basically all the emotions. My mom and I have talked about joining the One Room Challenge for a while now. We have admired from afar—both featured designers and guest participants. The wealth of inspiration feels like a treat when it rolls around every six months. Don’t let all that daydreaming fool you. Have we been preparing for the One Room Challenge? Have we started this renovation? That would be a resounding no. So, we will be doing the renovation in real time #livingontheedge. We have decided to tackle my living room. I feel butterflies-in-the-stomach giddy thinking about the end result. My family spends the bulk of our time in this room, and the room has stayed relatively the same since we moved in eight years ago. There is nothing wrong with how the room currently is, but the room is longing for a fresh look (it told me). FUNCTIONAL (All caps is no accident. I am shouting it). If I was designing the room for aesthetic only, the sky would be the limit. But, my family has to do life in this space, including my toddler and 60-lb. dog. Casual. We are decidedly un-fancy people. I hope the room is a place people feel welcome, where they can lounge and have good conversation. Eclectic. By this, I just want to incorporate different styles, not just stay in a single design lane. I appreciate when a room feels layered and has pieces that blend together. This is the room in its current state. The room has some good bones: the beautiful original hardwood floors, the big picture window, a fireplace. There will be some challenges though. Toy storage. No playroom in our little Cape Cod home, so it is natural for my one-year-old to play in the living room. Space is of high value though, so we are going to have to get creative. Or live a more minimalist life style. Seating. The seating needs to be maximized. Currently, four people can very comfortably hang out and that’s just not quite enough. I would love to squeeze in a couple more, but I am also competing with weird floor vent. big windows + sun = lots of awesome natural light. What throws a wrench into our equation? Giant trees in the front yard. Thus, about 3/4 of the year, when the trees have foliage, the room is actually pretty dark. Next week, we will go into the big picture design. In the meantime, make sure to check out the 20 featured designers and the other guest participants over at the One Room Challenge site.